We’d love your help. Let us know what’s wrong with this preview of Creating True Peace by Thich Nhat Hanh. "Creating True Peace" is both a profound work of spiritual guidance and a practical blueprint for peaceful inner change and global change. It is the Venerable Thich Nhat Hanh's answer to our deep-rooted crisis of violence and our feelings of helplessness, victimization, and fear. As a world-renowned writer, scholar, spiritual leader, and Zen Buddhist monk, Thich Nhat Hanh "Creating True Peace" is both a profound work of spiritual guidance and a practical blueprint for peaceful inner change and global change. It is the Venerable Thich Nhat Hanh's answer to our deep-rooted crisis of violence and our feelings of helplessness, victimization, and fear. As a world-renowned writer, scholar, spiritual leader, and Zen Buddhist monk, Thich Nhat Hanh is one of the most visible, revered activists for peace and Engaged Buddhism -- the practice he created that combines mindful living and social action. Having lived through two wars in his native Vietnam, he works to prevent conflict of all kinds -- from the internal violence of individual thoughts to interpersonal and international aggression. Now, in this new book, perhaps his most important work to date, Thich Nhat Hanh uses a beautiful blend of visionary insight, inspiring stories of peacemaking, and a combination of meditation practices and instruction to show us how to take Right Action. A book for people of all faiths, it is a magnum opus -- a compendium of peace practices that can help anyone practice nonviolent thought and behavior, even in the midst of world upheaval. More than any of his previous books, "Creating True Peace" tells stories of Thich Nhat Hanh and his students practicing peace during wartime. These demonstrate that violence is an outmoded response we can no longer afford. The simple, but powerful daily actions and everyday interactions that Thich Nhat Hanh recommends can root out violence where it lives in our hearts and minds and help us discover the power to create peace at every level of life -- personal, family, neighborhood, community, state, nation, and world. To ask other readers questions about Creating True Peace, please sign up. Conflict is a reality that needs to be dealt with. Compassion for the suffering of all sentient beings is at the heart of Buddha teaching. Is there a detailed study of the Buddha's teachings on the inevitability of wars, the killing that happens, the permissibility of killing invading armies if the motivation is pure, namely, the defence of innocents. Should a murderer face life imprisonment or execution ? The same feature of this book that caused annoyance was the same that caused understanding: repetition; it works. Like a CBT exercise, this book gets into your subconscious, hammering away at what makes you think the way you do. Lo and behold, the book is complete and you're acting mindfully about closing the covers, craving an orange, and basking in the optimism you're generating from within. I'll admit that even I wanted to pack up and move to a place where I could meditate unstopped. I truly b The same feature of this book that caused annoyance was the same that caused understanding: repetition; it works. Like a CBT exercise, this book gets into your subconscious, hammering away at what makes you think the way you do. Lo and behold, the book is complete and you're acting mindfully about closing the covers, craving an orange, and basking in the optimism you're generating from within. Hanh has some brilliant and insightfully clear observations and anecdotes but criticized too harshly my passion: novels. I don't think "reading to fill empty time" is a bad thing (unless it's Twilight); that irritated me. I have no problem with being mindful about slowly and thoughtfully drinking a cup of tea, but if I want to enjoy that tea with a book in my hand, it's not the end of the world and it doesn't mean I'm succumbing to violence. I also had a bit of a problem with alcohol being a "violent" thing; we cannot judge things by their potential. The stored-up potential of a bag of rice could feed x number of children or x-10 number of adults. We can't apply utilitarian principles to everything lest humanity become numbers and no longer individuals. His thoughts on consumption of violence were things I'd never before thought about and it caused me to be particularly observant of violence in my everyday life. You'd be surprised, horribly surprised. Count the incidents and observable acts. One huge idea this book did succeed in conveying to me (and changing my mind) was the notion that we are all interconnected. I embrace the idea of individual success and individual freedom but it seems it's a façade, after all. I am, indeed, the product of my ancestors; I, in turn, will be the ancestor of others. There is no way to escape the invisible, spider web-thin relationships we all have with each other. The world became an existential soup for me for a while and it made my mind hurt. I concede, Hanh; you are correct on this point. As usual, I am a bit behind the times. 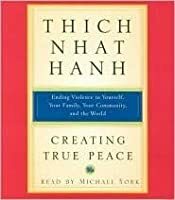 For lent, our church chose to read Creating True Peace: Ending Violence in Yourself, Your Family, Your Community, and the World by Zen Buddhist Thich Nhat Hanh. Well that was during March and April, and while I did read *most* of the book back then, I am finally finishing the last chapter now. Believe me, it was an interesting process reading and discussing a book by a Zen Buddhist with a group of very Maine Congregationalists. When we first picked up this b As usual, I am a bit behind the times. For lent, our church chose to read Creating True Peace: Ending Violence in Yourself, Your Family, Your Community, and the World by Zen Buddhist Thich Nhat Hanh. Well that was during March and April, and while I did read *most* of the book back then, I am finally finishing the last chapter now. ...our mind is like a garden that contains all kinds of seeds: seeds of understanding, seeds of forgiveness, seeds of mindfulness, and also seeds of ignorance, fear, and hatred. We realize that, at any given moment, we can behave with either violence or compassion, depending on the strength of these seeds within us. Thich Nhat Hanh spends the rest of the book discussing how to cultivate the seeds of compassion. The more we practice compassion, the more it will become a habit, a natural state. Likewise, the more we practice anger, our anger will become stronger and more frequent. It's simple, but very useful and worth being reminded of from time to time. One of the last things Thich Nhat Hanh talks about in Creating True Peace is sangha, or community. If we are a drop of water and we try to get to the ocean as only an individual drop, we will surely evaporate along the way. To arrive at the ocean, you must go as a river...We have to train ourselves to see the happiness of our community as our own happiness and to see the difficulties of our community as our own difficulties. I really enjoyed this book. It is about how to create peace for yourself when you are upset and how to help others find peace as well. One thing I really liked about this book is that he talks about the first step to creating peace between you and someone else is deep listening. When we listen deeply and let the other person talk, it gives us a chance to hear their side and their perspective and then we can feel compassion for them instead of anger. I also noticed things here and there in the bo I really enjoyed this book. It is about how to create peace for yourself when you are upset and how to help others find peace as well. One thing I really liked about this book is that he talks about the first step to creating peace between you and someone else is deep listening. When we listen deeply and let the other person talk, it gives us a chance to hear their side and their perspective and then we can feel compassion for them instead of anger. I also noticed things here and there in the book that reminded me of "If God is Love" and "The Power of Now." I can honestly say that this book has transformed my life in a very positive way. My partner and I both read it, and we were able to draw very practical and simple ways to live, love, and parent more skillfully from Thay's lovely prose. This book is truly life changing. It really illuminates the grasping, violent aspects of our Western culture -- and shows that it is possible to look at the world in a completely different way. It also explains the purpose of meditation and some techniques for meditation in a practical, totally understandable way. I checked this out from the library but have now bought a copy to keep on my shelf as a reference forever. My admiration for the author is boundless. I keep on reading books on mindfulness in the hope I'll be able to change my angry ways. Thich Nhat Hanh is always good at helping me to realize that I'm both my greatest helper and obstacle. In this time of strife and war, it is also good to remember that violence and hate breed more of the same. The only way to combat my rage or international problems is through thoughtful listening and partnership. The Buddhist philosophy was good for me to read during a time when I was really stressed out(Breathing in, breathing out). My dad actually recommended the book--he likes the similarity between authors' teachings and his Christian belief system. I agree and I'd like to read more of his books in the future. I am really glad that this was the first book I read this year. It was beautifully written and had some great reminders that are often forgotten in our hectic lives. I will definately try to incorporate some of his teachings into my daily routines and life. the right book for me at the right time. The last half of the book I would rate 4-5. It has some very interesting hypothetical conversations concerning changing personal/local/world habits using personal commitment. Certainly helps if you are a monk. A great one by Thich Nhat Hanh! Like with a lot of practices in various forms of Buddhism the practice s are both simple and hard at the same time. In a world addicted to violence, anger and conflict what Thich Nhat Hanh proposes is pretty radical but any amount of effort and change is better than nothing. This is a book I'll be coming back to. "If you cannot deal with the problem of violence and pollution within you, how can you deal with the problem of pollution and violence outside of you, in nature?" This book found me at a timely point in my life. To be read and practiced again, and again, and again. Creating True Peace is more than a book about spiritual enlightenment and peace. It’s a map that helps guide you through the wilderness in ourselves and the hectic world we live in. The destination is inner peace for all living things. Creating True Peace is written by world renowned Zen Buddhist, Thich Nhat Hanh, who has lived through two major wars in his homeland of Vietnam while practicing the philosophy of none-violence and peace. In Creating True Peace, Hanh expresses his solutions for act Creating True Peace is more than a book about spiritual enlightenment and peace. It’s a map that helps guide you through the wilderness in ourselves and the hectic world we live in. The destination is inner peace for all living things. Creating True Peace is written by world renowned Zen Buddhist, Thich Nhat Hanh, who has lived through two major wars in his homeland of Vietnam while practicing the philosophy of none-violence and peace. 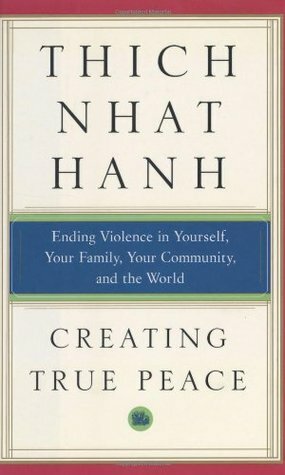 In Creating True Peace, Hanh expresses his solutions for actively engaging the epidemic of violence invading every level of our lives, from person conflict to war, in concrete ways. This book avoids vague metaphysics that often feel irrelevant when put in the context of modern life. Nhat presents Buddhist philosophy infused with a clear understanding of the global situation today. Whether dealing with extreme emotions and challenging situations or managing interpersonal and international conflicts, Thich Nhat Hanh relies on the 2,600-year-old traditional wisdom and scholarship of the Buddha, as well as other great scriptures. He teaches us to look more deeply into our thoughts and lives so that we can know what to do and what not to do to transform them into something better. With a combination or courage, sweetness, and candor, he tells us that we can make a difference; Whether dealing with extreme emotions and challenging situations or managing interpersonal and international conflicts, Thich Nhat Hanh relies on the 2,600-year-old traditional wisdom and scholarship of the Buddha, as well as other great scriptures. He teaches us to look more deeply into our thoughts and lives so that we can know what to do and what not to do to transform them into something better. With a combination or courage, sweetness, and candor, he tells us that we can make a difference; we are not helpless; we can create peace here and now. In Creating True Peace, Thich Nhat Hanh uses a beautiful blend of visionary insight, inspiring stories of peacemaking, and a combination of meditation practices and instruction to show us how to take Right Action. A book for people of all faiths, this is a magnum opus -- a compendium of peace practices that can help anyone practice nonviolent thought and behavior, even in the midst of world upheaval. I have to say I am very underwhelmed by this book as opposed to the other ones I've read by this author. On the positive side, I enjoyed reading about the Mindfulness Training, and how to 'transform arrows into flowers', which was why I chose to read it in the first place. Yet on the other side, I was surprised to find so many of his social activism comments judgmental. We all know our history about wars: The pain, the senseless loss, the destruction. From there, knowing that what has happened is I have to say I am very underwhelmed by this book as opposed to the other ones I've read by this author. From there, knowing that what has happened is done, and that we cannot go back in time to change it, we must learn from it as to not repeat it. This being said, I do not find helpful or "Creating True Peace" comments such as: "The US senselessly wasted many lives in this war when it could have (..)" or "(...) these countries (France and the US) are finally moving in this direction (of helping countries), but this could have happened much earlier (...)". We know the wrong that has happened and is happening in the world. Repeatedly pointing the finger at specific countries, or people, helps no one. We can speak in general terms to get our message across without shaming. I was recommended this book on a time when I was upset very oftenly, as well as sad. When I finally read it, I was already okay. However, that did not prevent me from learning something from it. Thích Nhânt Hanh suggest us, in this book, some methods for us to have self-control over our emotions when we are just too upset, or even when we don't feel like 'fighting' anymore. I found it very interesting how he sees those who are seen as very cruel people: for him, those are the ones suffering the m I was recommended this book on a time when I was upset very oftenly, as well as sad. When I finally read it, I was already okay. However, that did not prevent me from learning something from it. Thích Nhânt Hanh suggest us, in this book, some methods for us to have self-control over our emotions when we are just too upset, or even when we don't feel like 'fighting' anymore. I found it very interesting how he sees those who are seen as very cruel people: for him, those are the ones suffering the most and, thus, 'yelling' for some 'peace and love'. I don't believe, though, all his ideas can be used - or even if they should! Not everything can be solved with a calm and tender speech. Sometimes, some actions are needed. This was a good book. It related the practical advantages of being self-aware and compassionate to the real-world situations around us: our conflicts with our families and friends and also between soldiers and civilians, negotiators and leaders. It offers practical exercises on how we can defuse violence and promote peace in our lives. Most of these are, of course, come from a very Buddhist place, but they are the same sorts of things that anyone who learns to control their anger does: taking a This was a good book. It related the practical advantages of being self-aware and compassionate to the real-world situations around us: our conflicts with our families and friends and also between soldiers and civilians, negotiators and leaders. It offers practical exercises on how we can defuse violence and promote peace in our lives. Most of these are, of course, come from a very Buddhist place, but they are the same sorts of things that anyone who learns to control their anger does: taking a break, stopping a fight by refusing to fight, having a safe place and a confidant who can help you. The stories about living during the Vietnam War were poignant and very relevant. "Peace is not just simply fhe absence of violence; it is the cultivation of understanding, insight and compassion, combined with action. Peace is the practice of mindfulness, the practice of being aware of our thoughts, our actions, and the consequences of our actions." This quote from Thich Nhat Hanh basically surmises what this book is about. Concise and insightful, Thich provides spiritual guidance on how only through inner change and peace can we attain global peace. The teaching on the Five "Peace is not just simply fhe absence of violence; it is the cultivation of understanding, insight and compassion, combined with action. Peace is the practice of mindfulness, the practice of being aware of our thoughts, our actions, and the consequences of our actions." This wasn't the book I thought it was going to be. I wanted help with creating peace within myself to help create peace around me but by the end of the book I felt that it was a lecture to Americans. Maybe I missunderstood the intention of the book but I felt like there was a lot of finger pointing. There were some parts that I found helpful and I wish more of the book contained chapters similar to the middle chapters. I really like a lot of what TNH expresses in this book. I especially liked the descriptions of TNH's time of practicing nonviolence in the midst of war. I found myself wanting him to stick with describing those experiences. Instead, he moved on to other pieces of advice. I think the book could have been separated into different books and expanded upon. All in all, worth reading (or skimming). Good ideas are there. I've become a big fan of Thich Nhat Nanh's books and words. As I've a pre-biopsy consult with a surgeon in fifteen minutes, I need all the peaceful, hopeful, loving words I can get. ;) Reading Being Peace now, actually! He's helping me as I start a new peace "project" that's rather large scale. I recommend his books to everyone, but especially if you've hit a rough patch. Un diez. Un excelente libro de meditación al que recurro en muchas ocasiones. Una pequeña maravilla para aprender a construir mejor, sencillo pero de difícil digestión. Ojalá su lectira inspirara a más gente en sus buenas acciones diarias.